"Oil Pollution, and the Dynamic Relationship between International Environmental Law and the Law of the Sea"
Abstract: This Article examines the relationship between international environmental law and the law of the sea in the context of trying to address the problem of oil pollution in a coherent manner. Both of these branches of international law share a common goal, yet their relationship is inherently complex. Starting with a brief synopsis of international environmental law and the law of the sea, this Article then explores the ways these two branches interact in a dynamic manner. The Article demonstrates that they do not operate in isolation, but rather help shape one another. The authors then identify the situations where international environmental law and the law of the sea conflict, primarily in the provisions contained in international and regional conventions, which leads to a multifaceted legal framework that is difficult to follow in a coherent manner. In these cases, pursuing the rules of one regime could mean breaching provisions and goals of the other. The Article concludes with a case study on oil-spill pollution, which demonstrates how the two branches of international environmental law and the law of the sea simultaneously conflict and complement each other. 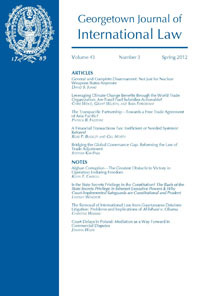 The main take-away point of this Article is the fact that the unity-versus-fragmentation debate regarding the law of the sea and international environmental law should serve as a reminder that coordination of these two legal regimes is needed in order to effectively adopt measures that protect the global commons. Accessible on LexisNexis. It is great to see the post on oil pollution and international environmental laws. Your post is very great to understand the details of the environment. It is great to see this post. The details of the post is the short view of this.